When he was writing his doctoral thesis at the KIT Institute for Process Control and Robotics (IPR), Bihlmaier looked at the issue of cost-pushers and arrived at the conclusion that in particular, integration costs are a major cost factor. They build up when specially trained engineers spend days, and sometimes even several weeks, integrating automation solutions in businesses. Gripped by ambition, he and his co-founders Dr Julien Mintenbeck und Dr Jens Liedke, who were also doing their doctorates at the Institute, decided to develop an innovative solution for the economical production and assembly of small quantities: a system with a network of modules which, like in a construction kit, can be flexibly combined and adapted within a plant to the respective product or the individual process within a minimum of time, which also makes its employment worthwhile when small quantities are involved. robodev combines hardware components with ingenious software control, providing a uniform system that is easy to use and does not require an expert to assemble it and put it into operation. “One or two days of training will do,” says developer Bihlmaier. Depending on the respective requirements, usable components range from simple sensors and actors to sophisticated image data evaluation and applications in robotics. Given the considerable encouragement the three founders received both at the Institute and from industrial partners, in early 2015, they decided to take part in KIT’s Spring School – Entrepreneurship for Researchers, where, for the first time, they had a look at financing issues and the protection of intellectual property. “This was the first step towards founding an enterprise,” says Bihlmaier, looking back. This was followed by taking part in the KIT Accelerator upCAT, where the team elaborated their business concept. Together with mentors, the prospective entrepreneurs Bihlmaier, Mintenbeck and Liedke analysed the huge market their idea was based on. What above all helped at this stage was communicating with other start-ups as well as talks with consultants from the Center for Interdisciplinary Entrepreneurship, CIE for short, and the KIT start-up incubator. robodev has now signed contracts on several pilot projects both with medium-sized enterprises and with major corporations. 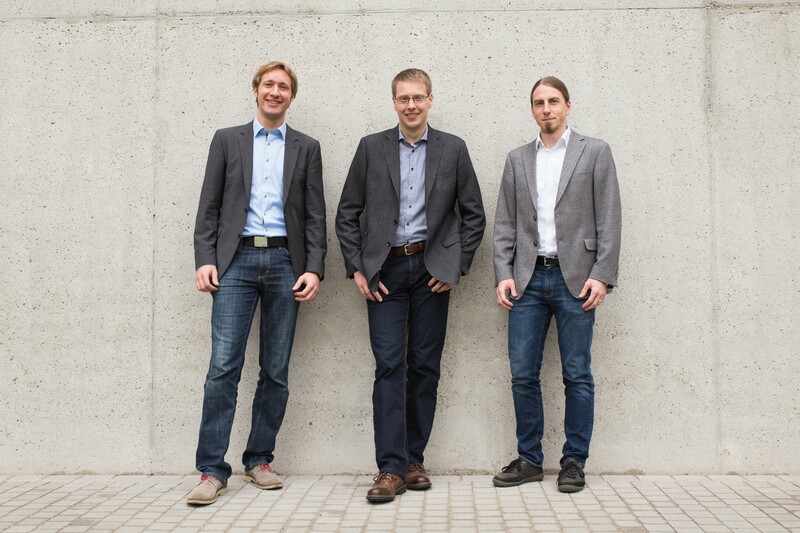 In addition, with Staufen.Digital Invest, the founders have opted for a renowned investor that focuses on technology and software businesses. For the next months, the team have planned to leave their rooms at the Institute and move into their own business quarters, and also to increase their staff. “We want to make use of the experience gained in the initial pilot projects in order to further develop the company and successively establish it on the German market,” says Bihlmaier. This entry was posted in Gründerstories and tagged Automatisierung, Automatisierungslösungen, robodev, Robotik, Spring School, Staufen.Digital Invest, upCAT. Bookmark the permalink.